Donald Schweter is a technical writer in Berkeley, California, whose background comprises early experience in machine shops and boat building. He has a B.S. (highest honors) in marine engineering from the U.S. Merchant Marine Academy and did graduate work in naval architecture at U.C. Berkeley. He spent 38 years seafaring as an engineer on merchant ships. During 20 years of this period he built, with his family, a 46-foot sailing catamaran. This craft was built from professional plans, of wood and epoxy. He fabricated the boat's metal hardware and designed and built its accommodations, as well as its diesel/hydraulic propulsion system. He then sailed from northern Oregon to Santa Barbara with crew. From there he sailed south solo to Mazatlan, Mexico. He holds the following licenses from the Federal Government: Chief Engineer of Merchant Vessels for steam or motor ships of any horsepower, and Private Pilot for aircraft. He built an Aleut baidarka (skin on frame) under the guidance of Wolfgang Brinck. He has kayaked and whale watched in the Sea of Cortez. 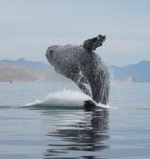 Illustrated right is a humpback whale breaching in the Sea of Cortez.